As you may know I tried to get on Survivor for 8 years, sent in 15 applications, went to 2 casting calls, had 2 face to face interviews, one long phone interview and was offered a place on 5 others shows including The Amazing Race. I never gave up and would not have ever given up until I made it onto Survivor. The theme of my Motivational Speaking engagements is “Dream it, believe it, prepare for it and DO It “ and I did just that. Everyone out there must do the same for whatever their dream or goal is. YOU CAN DO IT IF YOU BELIEVE in YOURSELF. My last video application was filmed in South Africa as I abseiled off Table Mountain with Abseil Africa, dived with Great Whites with Brian McFarland, Danced at the Shona Cultural Center and fed an elephant up to my elbows at Sun City. They were looking for an adventurous Granny and at 61 I fit that bill. I am one of 8 to play the game over 60. Another accomplishment for this South African player. I now come alive again in the game of Survivor down in my homeland. I wanted you to know and so you can tell your friends. 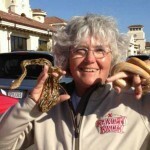 I am the only South African to play in the US game of Survivor and proud of it. I went into the game with the spirit of Ubuntu by which I lead my life. This came up during all my interviews and it fascinated the Survivor Production crew. I am published this week in TV Plus Magazine by Clayton Morar and I will be having radio interviews in South Africa later this week. Don’t know the stations yet. I intend to have a major South African presence and flavour in Reality Rally so I am asking for any leads any of you might have. I am looking for trips and goods for prizes and to auction off for the fundraising. Please pass my info on to anyone who can do something for me. I will always have my South African soul and thank my country for forming me in my youth, making me the person I am. What a pleasure it was chatting with you this afternoon – WOW. Stella and I are so excited about working with you to put a group together for South Africa and also about doing Mt Kilimanjaro in August 2010. Alles van die beste, Robin and Stella Mountain. 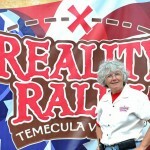 Reality Rally in Temecula Valley is up and running Reality Rally has taken off like roller coaster, check it all out.